It was the final everyone was asking for — the Golden State Warriors versus the Cleveland Cavaliers, featuring the newest league MVP against the world’s best player. The upstart Warriors somehow managed to make relatively quick work of the brutally competitive Western Conference andgoing 67-15 through the regular season before dispatching New Orleans, Memphis, and Houston in the playoffs, while the Cavaliers retooled their lineup after early season struggles and appear to be peaking at just the right time. The NBA, of course, is built upon star power. The most celebrated stars will shine brightest on the Finals stage, and the Bill Russell Award is a necessary part of any truly elite player’s resume. To decide this series, LeBron James will match his established championship pedigree up against the sharpshooting moxie of Stephen Curry, who is making his first trip to the NBA Finals. Stephen Curry emerged as the most skilled player offensively in the NBA this year, a feat which earned him the regular season MVP nod. Despite his relatively waifish frame and look, Curry is deceptively quick and strong on drives to the basket. Out on the perimeter, Stephen Curry will put moves upon moves — crossover, hesitation, and behind the back dribbles — to drive into the lane. If the defense packs the paint, Curry will simply feint a hard drive to the hoop, before stepping back and raining down a three. As a scorer, Steph Curry averaged 24 points per game, on 44% three-point and 91% free throw shooting in the regular season. 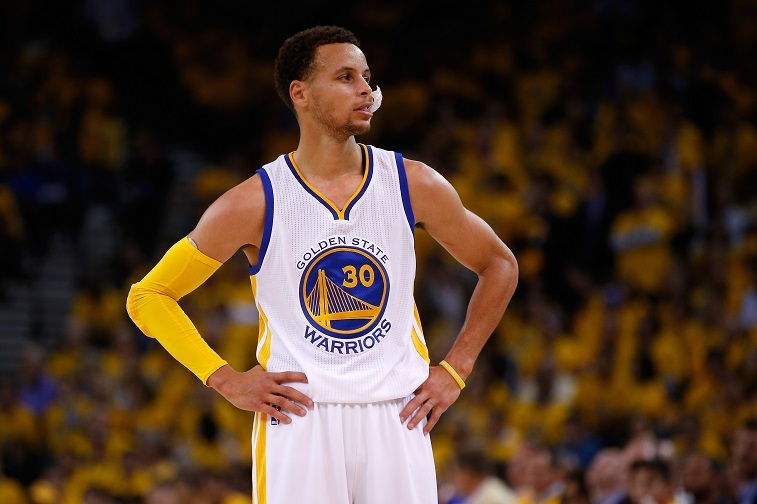 For the 2015 Playoffs, Curry has upped his game even further, averaging 29 points per contest. When doubled, Curry would often give the ball up at the top of the key, before running his man ragged through a series of screens, en route to a wide open corner jump shot. Curry has already dispatched of fellow All-NBA First Teamers Anthony Davis, Marc Gasol, and James Harden, and could add LeBron James to that list. Kyrie Irving will likely take the first assignment against Stephen Curry. Irving, of course, has battled through nagging leg injuries throughout this playoff run. The Cavaliers may also switch Matthew Dellavedova, J.R. Smith, Iman Shumpert, or even King James himself onto Curry, if a hobbled Irving lacks the foot speed to fight through screens and chase down the league MVP through four quarters. In either scenario, Stephen Curry is a match-up nightmare for the Cleveland Cavaliers and could catch fire at any moment to blow this series wide open. 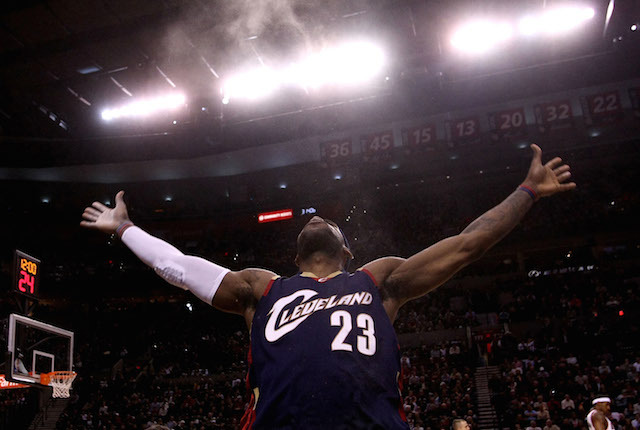 Stop us if you’ve heard this before: The Cleveland Cavaliers will go only as far as LeBron James takes them. LeBron James has already made four trips to the Finals (claimed two championships) and 2015 will mark his fifth consecutive appearance in the Finals, an achievement not accomplished since the 1960’s Celtics Dynasty. For the Cavaliers, it will be their first Finals series since 2007, during Lebron’s first stint with the team. It’s an interesting twist from the start of the year, one mostly unspoken reason for James returing to Cleveland was the fact that Miami was falling apart, and with the Cavs he could take on somewhat of a lesser role, ceding responsibility to Kevin Love and Kyrie Irving. But, of course, Love was knocked out of the playoffs in the first round after tearing his labrum, while Kyrie Irving was slowed by foot and knee injuries that took away his explosive first step. In response, LeBron nearly averaged a triple double in the Eastern Conference Finals, beating up on the Hawks to the tune of 30 points, 11 rebounds, and nine assists per game. Going forward, James must turn in an encore performance for Cavaliers to have any semblance of a chance against the high-octane Warriors. Sidekicks and supporting cast members have just as much of a chance to Finals MVP hardware as superstars, just ask Kawhi Leonard, Tony Parker, Joe Dumars, and James Worthy — who nabbed the nod over teammates like Tim Duncan, Isiah Thomas, and Magic Johnson. “the other guys” are often left free to exploit holes in defenses that overplay the star player, and the second Splash Brother, Klay Thompson,will be a tough cover for Cleveland as he’s just as deadly beyond the arc as his more-famous backcourt mate. The Cavs will struggle to hide Kyrie Irving when both players are on the floor at the same time. We expect Cleveland’s first priority will be to shadow Stephen Curry with their team’s best defenders. A good idea, and essential to beating Golden State, but leaving the weaker wing defenders on Klay Thompson is nothing less than playing with fire. Left alone, Thompson can very easily go off, having a field day running off screens and driving past both of these slower players. For his part, Klay Thompson did pour in 22 points per game through the regular season. In the playoffs, however, Thompson’s numbers have been down across the board, especially after going toe-to-toe against defensive maven Tony Allen in the second round. 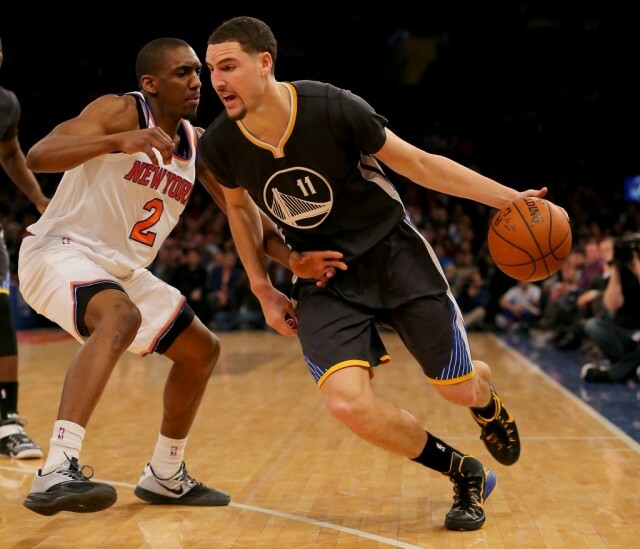 For the Finals, Thompson may very well emerge as the perfect X-Factor, waiting to be unleashed. All data courtesy of Basketball-Reference.